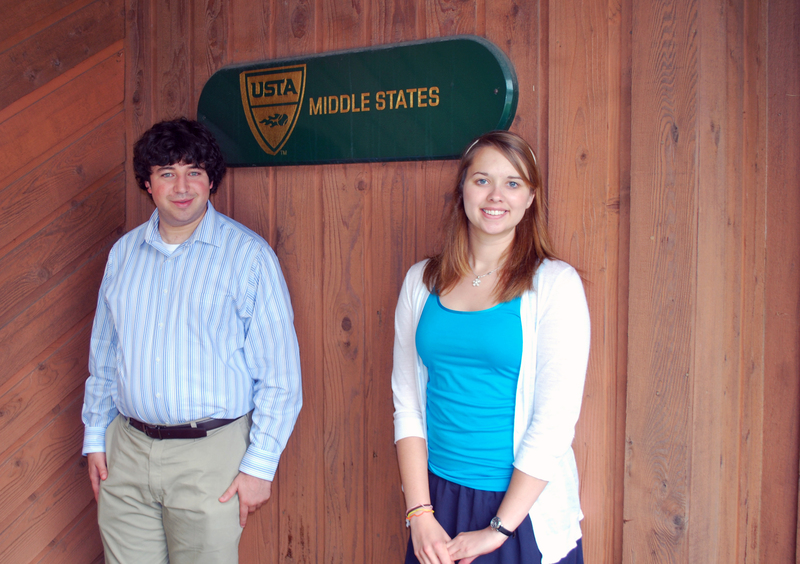 USTA Middle States is pleased to welcome Drew Balis and Kate Robertson as interns at the Valley Forge office. Drew and Kate will work primarily in the Marketing and Communications Department alongside Marge McGann, Michael Gladysz and Kate Verheyen, but will gain valuable experiences in all areas of the Middle States Section. Drew recently completed his junior year at Pennsylvania State University. At Penn State, Drew is enrolled in the Smeal College of Business, where he majors in Marketing. He also has a minor in Spanish through the College of the Liberal Arts. Drew is heavily involved on campus and within the State College community. He interns for the Penn State baseball team and also covers Penn State football as the athletics editor for OnwardState.com, a student-run online news organization. Drew also serves on committees for Homecoming and THON, the Penn State Dance IFC/Panhellenic Dance Marathon, which works to provide financial and emotional support for the fight against pediatric cancer. Drew was raised in the Philadelphia suburbs and graduated from Neshaminy High School in 2009. He considers coaching a youth basketball team to a championship as one of his biggest accomplishments growing up. He is a big Philadelphia sports fan in addition to being a fantasy sports enthusiast. A few of Drew’s other hobbies include writing, running and blogging. Kate, a junior at Virginia Tech, resides in Chester Springs, Pa., but was born in North Carolina and spent much of her youth in North Carolina and Georgia. She attended Owen J. Roberts High School, where she played on the girls’ tennis team all four years. She played varsity her junior and senior years, and was a member of the 2008 PAC-10 Championship team at second doubles. At Virginia Tech, Kate is an Honors student pursuing a double-major in Communication and English, with concentrations in Public Relations and Creative Writing. She is the Editor-in-Chief of Philologia, the Undergraduate Research Journal of the College of Liberal Arts and Human Sciences, and is an active member of the Public Relations Student Society of America. She has had articles published in Philologia and The Medium, the PRSSA newsletter, as well as on the PRSSA blog. Kate is a member of the National Society of Collegiate Scholars and Sigma Tau Delta, the International English Honor Society. Outside of academics, Kate enjoys attending Virginia Tech football and basketball games, participating in community service events, exploring the trails around Virginia Tech, and playing music. Drew and Kate will be with Middle States throughout the summer, gaining experience through involvement in a variety of events including Philadelphia Freedoms’ World TeamTennis, Middle States adult and junior championship events, Middle States Hall of Fame, and much more. Ask Aunt Sally – Was that my point?